E-Commerce Websites Design, Online Shop & Selling Solutions. 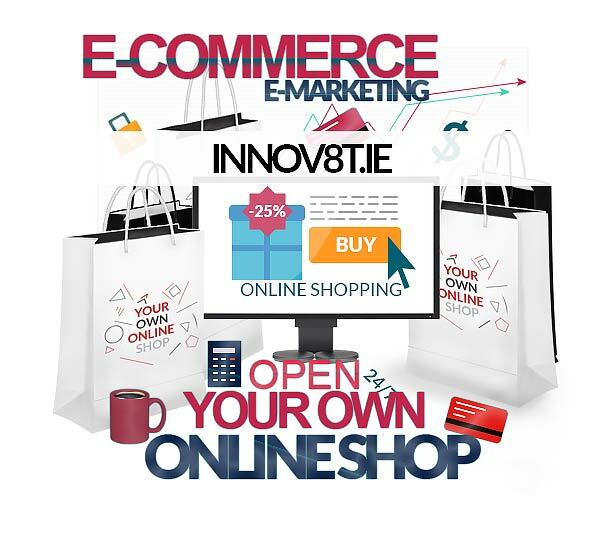 Innov8t designers and developers are vastly experienced in designing and developing the ideal ecommerce solution for your business whether you want to Trade online, Sell online, Book online or just take Payments Online we can help. Online sales accounts for approximately 21% of all retail sales in Ireland and the UK, having doubled from just over 10% in 2014. A recent report from PWC shows that 33% of people will shop when a mobile payment option is available, 34% of 25 to 34 year olds shop online at least once a week and a whopping 94% of 18 to 24 year olds are influenced by online and social media in what they purchase. So with the market growing and accessibility to the internet easier than ever you need to put your goods and services online and available for all to secure, book, purchase and pay online. We have the solution for you our e-commerce platform will cover all of your requirements and grow with you as you expand your business. Our e-commerce solution is easy to use, easy to add and remove products and each product can be shared easily to your social media platform. We can combine all of the functionality required within a bespoke design that will allow you to reach a much larger market. All of our e-commerce websites are SEO optimised and come with secure encryption for all online payment transactions. There are grants available if you wish to trade online for more information REQUEST A CALLBACK today.